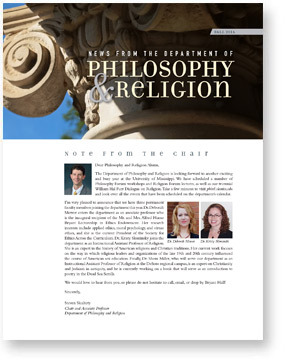 For Policy Talks, three panelists (two alumni of the Philosophy and Religion Department as well as one regional leader) each offer a short proposal on a contentious and real-world issue (topics vary by year). Panelists discuss what they think the best approach or resolution would be to address the issue given their expertise. After the panelists each give their presentations, a second panel of University of Mississippi faculty pose questions to the initial panelists and a brief conversation among all the panelists. The audience may submit questions to any of the panelists (guests or UM faculty) screened by a moderator (to ensure relevance, clarity, civility). Following the panel of speakers and Q and A session is a catered reception at which attendees continue the conversation with panelists informally. The common reading resource (click for PDF) for this event is the Honors thesis of Religion major Samuel Brassell. This thesis provides an analysis of religious freedom laws in the state of Mississippi. We encourage all attendees to read this common reading resource prior to the event for a more focused conversation during the Q and A session and during the reception.